January 2015 - We're looking forward to seeing you in Booth 3531 at AHR 2015. We'll be showcasing our portfolio of open building automation and control solutions that allow systems integrators to Integrate and Control and Visualize and Communicate. The future belongs to IP-based controllers such as these BACnet/IP-compliant controllers featuring either Niagara Framework or Sedona Framework doing freely-programmable control. A Niagara head-end can be used to supervise BAScontrol20s over Ethernet. A five-port Skorpion Ethernet switch connects all the controllers together. Programming either of these controllers is accomplished with a standard Workbench tool by assembling components onto a wire sheet to create applications. The BAScontrol20 is compliant with the BACnet B-ASC device profile. It has eight universal inputs, four binary inputs, four analog outputs, four binary outputs (triac or relay models), and a real-time clock with seven-day retentive memory. Besides having 66 Sedona components from Tridium, it has 100 custom components from Contemporary Controls. These include 48 web components that can be viewed and manipulated by a web browser, and 24 virtual points that can be read or written by a BACnet client. Not all devices are BACnet/IP compliant so either a gateway or router is required for non-compliant devices. The BASrouterLX provides standalone routing between BACnet/IP, BACnet Ethernet and BACnet MS/TP. Here it is attached to a Honeywell BACnet Spyder which is MS/TP compliant. The BASrouterLX attaches to a BACnet client via a 10/100 Mbps Ethernet network, and can support serial data rates up to 115.2 kbaud. It has the ability to capture MS/TP traffic for viewing by a Wireshark network analyzer. The BASgatewayLX provides standalone gateway functionality between Modbus RTU or Modbus TCP devices and BACnet/IP. Using the concept of Modbus device profiles, Modbus registers are mapped to BACnet objects. Using virtual routing, each Modbus device appears as a BACnet device allowing devices with identical device profiles to share the same gateway. Here the BASgatewayLX connects to Modbus compliant Cube I/O. The BASremote is both a Sedona field controller and a Modbus gateway providing flexibility when connecting to a BACnet/IP client. The attached Cube I/O provides convenient I/O expansion to the BASremote. The BASview provides a simple-to-use head-end for smaller buildings requiring schedules, trends, alarms, runtimes and custom graphics. It is easy to learn and use. Being BACnet/IP compliant, it can connect directly to BACnet/IP server devices and to Modbus devices using gateways. All commissioning and viewing is via web browsers. The BAScontrol20 Demo Board is BACnet/IP compliant and is used here to simulate field equipment by executing a Sedona wire sheet loaded in the unit. 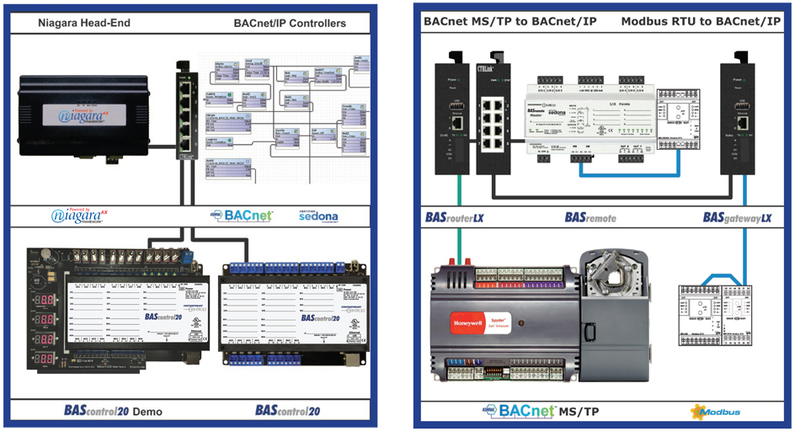 The BASremote is both BACnet/IP and Modbus TCP compliant. 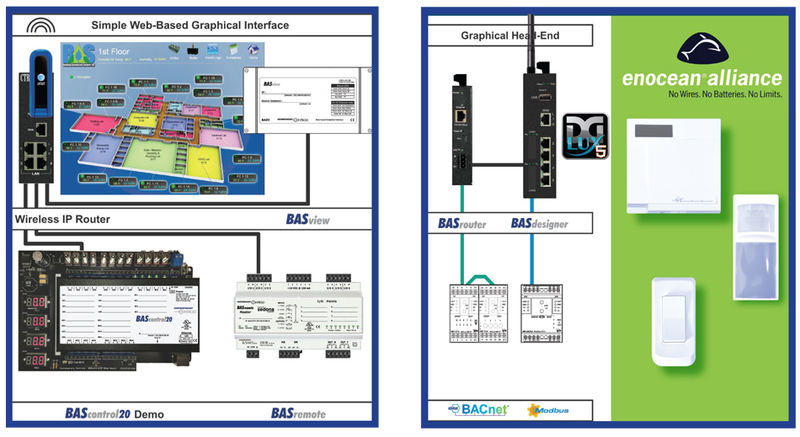 Both BACnet and Modbus points from the BASremote can be monitored by the BASview over Ethernet. The EIPR is a wired or wireless IP router. It is also simple to use providing a stateful firewall to WAN-side devices. On the LAN-side are the BASview with its attached server I/O points. The EIPR can function as a LAN-side Wi-Fi access point. On the WAN-side there can be a modem to the Internet or a connection to a cellular network. Either a wired or wireless approach allows access to the BAScloudVPN. A sophisticated graphical head-end can be found in the BASdesigner. Powered by DGLogik, the BASdesigner has a HTML5 user interface with impressive graphics along with trending, alarming and scheduling. It is BACnet/IP compliant with two resident opto-isolated serial ports that can integrate to Modbus RTU as shown connected to a Cube I/O. Using a standalone BASrouter, a connection is made to a BACnet MS/TP Cube I/O. Two Gigabit Ethernet ports reside in the unit - one with a four-port switch. In addition to wired connections, The BASdesigner has two wireless ports - Wi-Fi and Enocean. The BASdesigner is ideal where a comprehensive head-end is required along with wired and wireless connectivity options. Enocean with its tagline - no wires, no batteries no limits - provides a novel way of attaching field sensors with little installation expense. Ideal for historic buildings or retrofits where a wired connection is discouraged, Enocean is an ideal choice and is directly supported by the BASdesigner. Sample Enocean devices such as an on/off switch, temperature monitor and a presence sensor are only a few available from the Enocean community. We are looking forward to visiting with our existing customers and meeting new ones. Be sure to stop by Booth #3531 to say hello.